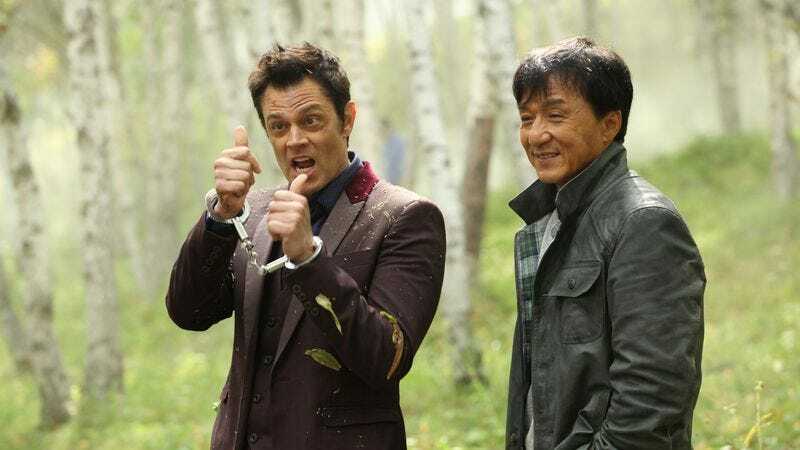 “You’re no spring chicken,” says an American gambler to his Chinese friend midway through the East-West action extravaganza Skiptrace. It’s a put-down that’s meant less for the character than the guy playing him. Since Jackie Chan has been kidding his age on screen for at least a decade now, the joke hardly feels fresh, but as there’s an inherent fascination in watching idols age, this otherwise mediocre film has a certain elegiac power. It opens like a parody (or maybe a rip-off) of any number of Hong Kong policiers, with Chan’s upstanding Bennie watching his partner die during a drug raid gone wrong; as the film goes on, he’ll gain a new sidekick in the form of Connor Watts (Johnny Knoxville), a skeezy gambler who’s decamped to China after getting exiled from homegrown casinos, and whose path crosses with the super cop’s through plot machinations too complex to synopsize here. The storyline in Skiptrace is a compendium of generic clichés, none of which get much of a workout. What’s potentially interesting is the location shooting (in Mongolia and the Gobi Desert) and the spectacle of Chan smacking down stuntmen at age 62, which he does with slightly mechanical aplomb. (At this point, it’s less about urgency than muscle memory.) Knoxville isn’t as starry a Hollywood foil to his co-star’s iconic stoicism as either Chris Tucker or Owen Wilson, but playing a jackass is right in his wheelhouse and in one action set piece, he’s very funny as a kind of tightly bound human prop. The biggest present-tense star on display is probably Fan Bingbing, whose role as the daughter of Bennie’s late partner is the dictionary definition of “thankless.” Former WWE star Eve Torres makes a bigger impression as a hulking, iron-fisted henchwoman. Director Renny Harlin (Die Hard 2, Deep Blue Sea) has declined since his early-’90s days as the poor man’s Wolfgang Petersen, and while he does a professional job with the fight scenes, he doesn’t have the light touch required for the (endlessly) extended stretch of Hope-Crosby picaresque that serves as the movie’s middle (and peaks, if that’s the word, with Chan crooning Adele’s “Rolling In The Deep”). 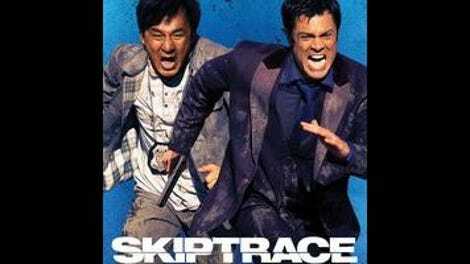 Overproduced and underwritten, with editing that feels more like it’s filling gaps in the story than playing skillfully with space and time, Skiptrace is a movie made to serve a number of competing interests and markets, and in trying to offer the proverbial something for everybody—i.e., thriller twists side by side with slapstick comedy—it ends up possessing a very limited appeal.